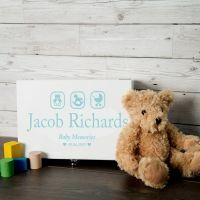 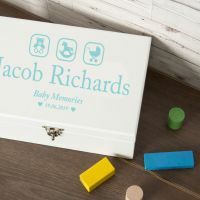 Luxury Keepsake Box for a Baby Boy. 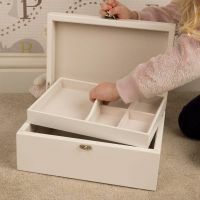 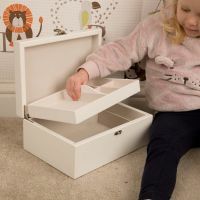 Felt lined throughout and features a pull out tray for smaller keepsake trinkets as well as a deeper storage box for those life long keepsake memories. 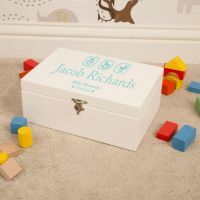 Ideal present for a new Baby Boy as well as a 1st Birthday Gift or Special Occasion such as a Baptism or Naming Day. The Box is made from wood, painted white and is hinged and has an attractive silver clasp. Personalize your box with the Full Name of the Child, the Occasion as well as the Date of Occasion. Please note Occasion Field currently says "Baby Memories" but can be altered to any appropriate text such as "My Christening Day" etc. 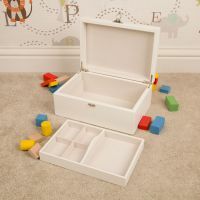 Dimensions: approx 29cm x 20cm x 12cm. Weight (unboxed - approx 1.78kg - Boxed approx 2.27kg).